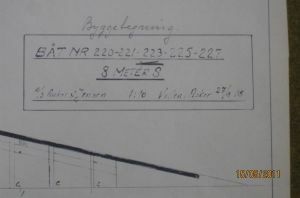 This section wil follow the evolution of Anker & Jensen yard no 223 from Johan Ankers drawing dated 27.09.1918, laid down in spring 1919 for owner Arne Blakstad, modified fall 1919 and commissioned spring 1920 for Eilert Sundt with first mesurement certificate as new International R-yacht, dated June 2nd 1920, sail racng no 8 N11, named "Verano II". Parts to be included as adressed by the author (myself). Johan Anker had succes with his 1917 designed S-Eights of which contract had been entered into for 8 yachts of which 7 was constructed in 1918. The Kattegat Cup had been transfered to the new S-Class and was won by Ankers sH25 "Apache" owned by Magnus Konow. As always Johan Anker works on improving, making his next design faster than the previous. Compared to the 1917 S-Eights his 1918 S-Eight design has an increased max beam from 2.36 m to 2.45 m and more "volume" above L.W.L. If his new design is faster than the one of fall 1917 can only be proved when racing in the summer of 1919. 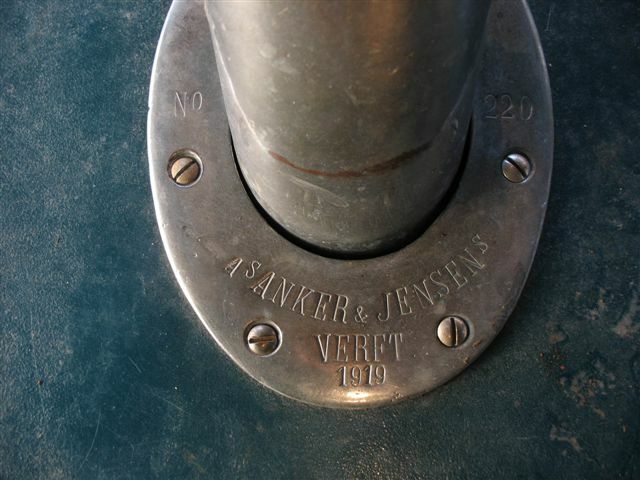 In total Anker & Jensen constructed 13 Eights baced upon Johan Ankers S-yacht designs of 1917 and 1918 including the modified to new international R-yacht, yard no 223. WWI is over and J.A.Jespersen as many other yachtsmen is looking for an Eight to compete with in the in 1920 upcoming Olympic Games. He places an order with Anker & Jensen for an S-Eight in accordance with Johan Ankers new design and takes out sail racing no sH33 yacht named "Rocambole" to be launched in spring 1919. However, Ankers new design is unproven and when the contract for Ankers 8 th yacht of his design of 1917 sH31 "Sans Souci" ordered by Scappel, London, is cancelled, Jespersen accepts the offer to take her over and transferes his sail racing no sH33 and name "Rocambole" to "Sans Souci" as the last of Ankers 1917 S-Eights constructed but launched in spring 1919. 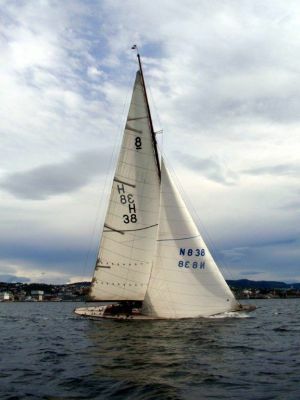 Sail racing no sH31 is free and becomes later the sail racing no of the last contract placed for the fifth of Ankers 1918 S-Eight design "Trolljo III" (A&J yard no 227). Seilas yachting magazine of April 23rd 1919 reports on page 79 about four Eight Metres being constructed at Anker & Jensens Verft in Vollen, Asker that spring, i.e. 8mS "Betty III" ordered by shipowner Jac.M. Lindvig, Kristiania, one 8mS for Engineer Arne Blakstad, one 8mS for Mr. Mathias Christophersen, Tönsberg and one 8mS (owner not mentioned - i.e.Thomas). The 4 yachts ordered are to be known as sH34 "Betty III" (yard no 220), sH35 "Knabb" (likely yard no 221), yard no 223 for Blakstad (likely sH36) and sH37 "Koh-I-noor" (likely yard no 225 ). A fifth yacht (yard no 227) is later ordered in accordance with Ankers drawing of 27.09.1918 by Mr.Gunnar Rabbe, Kristiania and given the vacant sail no. sH31 named "Trolljo III". 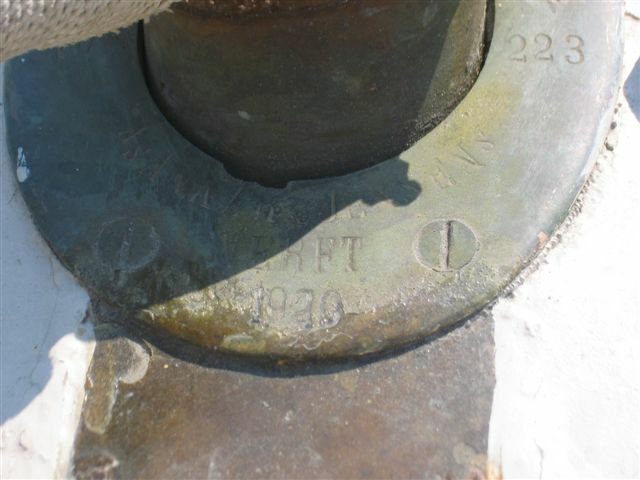 As such the five yard numbers 220, 221, 223, 225 and 227 noted on Johan Ankers drawing of 27.09.1918 are accounted for. Arne Blakstad who is an engineer and devoted 6mR sailor, is as Jespersen, Konow and many other yachtsmen looking for an Eight to qualify with to the upcoming 1920 Olympic Games. In spring 1919 the question about the renewal of the international R-rule arose. Johan Anker and SSF - the Scandinavian Sailing Federation promotes the S-rule as new international, however, this is in summer 1919 far from accepted by the British, ref http://snarken.page.tl/Part-1.htm. 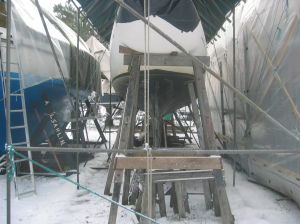 Arne Blakstad cancels his contract for A&J yard no 223 and his race sailing no sH36 is free for use by others. 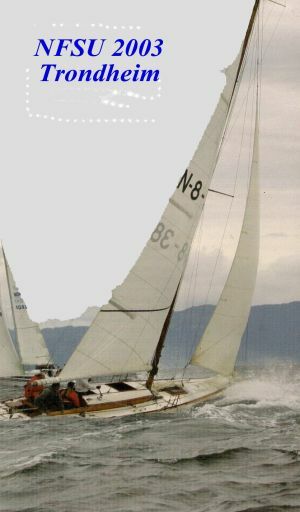 Race sailing no sH36 is given to the last S-Eight constructed, i.e. sH36 "Anchen" designed by Svenningsen, known as sH36 "Anchen" (ex "Avance II" which likely is the name Blakstad had on A&J yard no 223 before contract cancellation. The yacht name remaines in the Register managed by SSF -Scandinavian Sailing Federation). 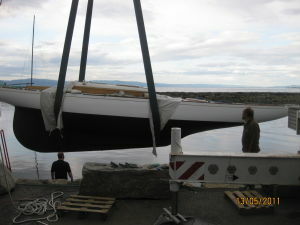 Burton and Heckstall-Smith from Britain visited the 1919 spring regatta in Oslo on June 14th and 15th and they were both impressed by the high standard of the Norwegian sailors in handling their yachts and the yacht construction methods. In other words the British became frightened by the Scandinavians and their yachts performance. The chance of the S-rule becoming new international without alterations from the British was not to come. The question if Ankers S-Eight design of 1918 was faster than his 1917 design was open. Magnus Konow (one of Norways best sailors) with sH25 "Apache" did again qualify to represent KNS in the Kattegat Cup races in 1919, which he won for the second time. However, as well known, sailing is more than boatspeed, it is also a question of boat handling. With Johan Anker at the helm In KNS regatta July 10 - 13th 1919, A&J yard no 220 "Betty III" (also named Inger and Madelon) of Ankers 1918 design won all 4 races, with Konow and "Apache" (design 1917) in second place, occasionally also beaten by "Koh-i-noor" of Ankers 1918 design. The sailing season of 1919 ended and the I.Y.R.U. meeting in London Oct. 1919 was called for in order to agree upon the 2nd International rule. In London Johan Anker and SSF advocates strongly for the S-rule to become new International. They succeed to the point that the S-formula is accepted as International R-rule, however many of the factors and measurement instructions are changed. In principle the British wanted larger hulls to cope with the large sail areas, while Anker wanted to keep the hull size and reduce sail area, thus keeping construction cost down. This discussion was mainly won by the British who wanted to add more planking to the freebord while Anker argued for cabin top on Eight Metres for cruising purposes. Cabin top on Eights was made volontary in Oct. 1919. The factors favorizing greater hulls were to be evaluated after 2 years. In the meantime Anker was left with ensuring that all his latest designs - the S-yachts of 1917 and 1918 could measure in as new international R-yachts without other alterations than on sail area. As such restrictions as min desplacement and others were all agreed not disqualifying the S-yachts from being converted (measured) to new International R-yachts. Returning home Anker had likely made up his mind how to convert his own sH22 "Brand V" to new international by putting on cabin roof, trim her sail area and remeasure her to the new R-rule. Based upon the converted 8N1 "Brand V" Anker & Jensen entered into contracts for converting several of this and last years S-yachts to new international. One of the early conversions were Jespersens sH33 "Rocambole" converted with cabin roof and remeasured to 8N4 "Rocambole". A&J yard no 223 was laid down in spring 1919, her bled keel with keel plank. To what extent the construction had come before Blakstad cancelled the contract is hard to know. Johan Anker made up his plan for modifying her to new international. 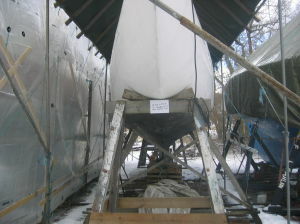 Her frames before and aft the 55% measurement position were altered giving her more "volume" without altering her keel shape and depth. She was also fitted out with cabin roof similiar to "Rocambole". The same cabin roof is mounted on modified yard no 223 "Verano II". 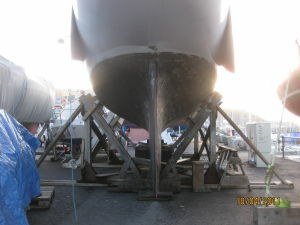 The additional weight of increased frames, hull planking and cabin roof on modfied yard no 223 made it necessary to reduce the weight of her bled keel in order to make her float on the design waterlevel. 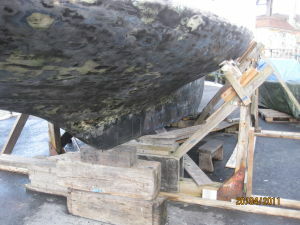 This was accomplished by chopping out bled on both sides of the bled keel up under the keel planking and replace the chopped out bled with cement. (When helping out my father as a kid, I many times wondered why it was cement on the mid side of the bled keel up against the keel planking. Now I understand why.) The amount of bled chopped out might have been 80 - 130 kg? This amount was in the late 1970-ties casted on to the keel by my father when he installed larger keel bolts. Thus making her in my opinion float to deep in the stern. I have as part of my tuning up since 2005 adjusted her ballast making her again float closer to her original design L.W.L. Ankers modified yard no 223 international R-Eight design was sold to Eilert Sundt for completion in spring 1920. Eilert Sundt named her "Verano II" and acquired race sailing no 8N11 after many of the in fall 1919 acquired sail no for converted S-Eights. Not all ordered conversions were carried out as initially agreed. For instance yard no 220 "Betty III"(Madelon) seems not to have been fitted out with cabin roof (volontary) although her racing no as new international was 8N9 compared to "Verano II" 8N11. "Betty III" ( http://snarken.page.tl/sH34-Data-sheet.htm )measurement certificate as converted new international is dated June 15th 1920 while the certificate for modified "Verano II" is dated June 2nd 1920, so the chronological order of convertions and modification is hard to determine. There is litle room for doubt that "Verano II" - "Snarken" as she remains today is laid down based upon the same drawing as her sister yacht "Betty III" - "Madelon. Pictures taken of both yard no 223 and yard no 220 shows the similiarity. She is going to be constructed for a consortium and given race sailing no 8N2, later to be know as "Sildra". At the time of finishing her design, Anker has left the idea of cabin roof as this is not a requirement. "Sildra" displacement is increased compared to his S-Eight designs with larger freeboard and more depth. Jespersen who has converted his 8 N4 "Rocambole" of Johan Ankers 1917 design, acquires "Sildra". However, during the trials Konow with his sH25 "Apache" converted to 8N3 "Apache" beats "Sildra" in most races. Konow joins in with Jespersen on board "Sildra" and they win Gold in the 1920 Olympics with converted 8N6 "Lyn" ex sH27 "La France" of the same design as "Apache" in second place. In year 1921 the S-Eight owners decides to go back and race in their own S-Class as 8 N2"Sildra" and Anker new design 8 N18 "Brand VI" proves superior especially when wind pickes up. Although "Verano II" has a S-certificate she is in 1921 not allowed to race in the S-Class. This likely as she did not longer confirm with the S-rule measurement requirement of G+B aft the measurement point not to exceed G+B in the measurement point. As such she was rated as true International R. In the next KNS register 1923-24 she is listed in the 1st International R- rule Class named "Fandango II", which likely was done as she was laid down before the Oct 1919 meeting in London when the 2nd R-rule was agreed upon. The converted 1st Rule Eight 8N16 "Sans Atout" returns to the 1st Rule Class with her old sail racing no H11, and the converted 9mR - 8N12 "Pandora" returns to the 9 meter Class. 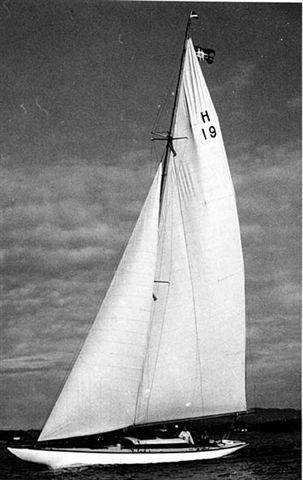 Later sail no 8 N12 is given to Johan Anker design of 1922, 8mR "Bera". In the I.Y.R.U. October 1919 meeting the bow girth difference factor and stern girth diference factor were agreed to remain as in the 1st International Rule of 1907 with factor 1 at the bow and factor 1/5 at the stern. Total sail area in formula S=90.32 m2 of which 22.04m2 relates to the 85% foretriangel and remaining 68,28 m2 is the main. This corresponds to "Verano II" S-certificate of May 14th 1921 with main 68.28 m2 and 100% foretriangel 25.93 m2 giving a 100% total under the S-rule of 94.21 m2. In 1924 a movement was placed to move the exemption in article 20 from the 2nd R-rule. The decision was made in I.Y.R.U. meeting in fall 1924 to take out the exemptions in article 20 from Jan 1st 1926. This was devastating for the older yachts still racing. 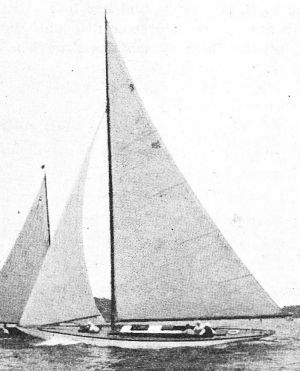 R-yachts designed before Jan. 1st 1920 which wanted to renew their 2nd rule certificates would have to conform with the increased bow and stern girth penalties, and as such reduce their sail plans accordingly which not only was a technical matter but also a matter of cost not many of the old yachts owners wanted to undertake. This as an effort to try to keep the old yachts racing without having to spend cost on renewing sails. YEAR 1926 - The extention of the 2nd R-rule of Oct 1919.
for a 6 years period from Jan. 1st 1920 to Dec. 1925 was extended from Jan. 1st 1926. Subject to yard no 223 8 N11 "Verano II" her R-certificate was up for renewal in June every 2nd year from her first certificate issued June 2nd 1920. As such her R-certificate was up for renewal in June 1926. 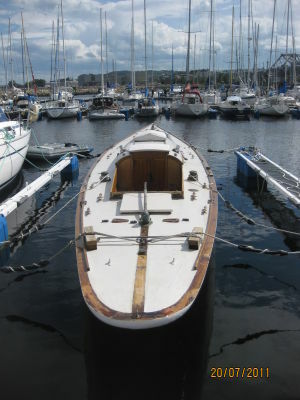 In order to satisfy the changes in Article 20 she in 1926 has to comply with the increased penalty in bow and stern girth difference factors from 1 to 1,5 and from 1/5 to 1/3. This is accomplished by reducing her sail area and moving the mast aftwards. stern girth difference 1/5 is 0.234 which with factor 1/3 becomes 0.234x5/3 = 0.390, an increase of 0.156. In total an increase of 0.333+0.156 = 0.489 to be compensated for by reducing factor "S" in formula. The only certificate in existens from this period is her S-certificate as "Idyll III" dated June 8th 1926. The date June 8th and year 1926 indicates that this certificate has not come about as a renewal of the S-certificate for "Verano II" of May 14th 1921 (found not acceptable), but more likely as a renewal of her 2nd rule R-certificate which is up for renewal every 2nd year in June, ref. dated June 2nd.1920 and June 1st. 1922. It seems that she in June 1926 has been up for renewing her 2nd R-rule certificate, adjusted for the change in clause 20 (increased bow and stern girth difference factors) when suddenly she is being accepted to measure in to the S-rule for racing in the combined old (1st R-rule and S-rule) Class. 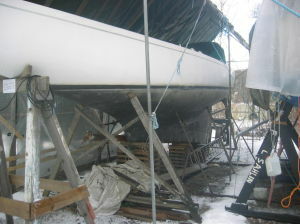 The changes in sail area and moving the mast aft are already been made. 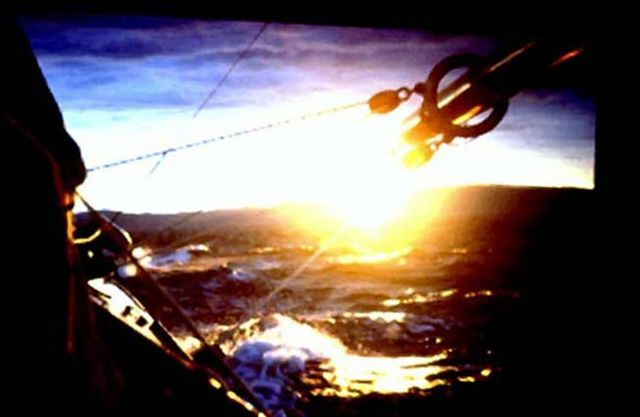 Then the length of her spinnaker pole is increased giving her a larger "J", in order to take out what she may under the S-rule. The S-rule was made valid for 5 years from Jan. 1st 1918 to Dec. 31st 1922 and the 1st R-rule elapsed Dec. 31st 1917, so what seems to be is that she in 1926 did not have to comply with the G+B requirment under the S-rule. In her S-certificate as "Idyll III" dated June 8th 1926 her main sail area is cut back from original 68.28 m2 to 62.83 m2 and her boom shortened from 9.40m to 8.60m to compensate for the increased penalty in bow and stern girth differences under the 2nd R-rule enforced from Jan 1st 1926. The increase in foretriangel does not effect the measurement as "J" is the length of the longer spinnakerpole. 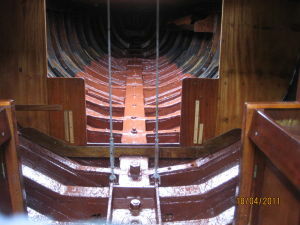 picture taken on starboard looking aft. from moving mast aft, picture from starboard side looking forward. The movement made by the British in 1924 of removing the exemption in article 20, and in Norway making "Idyll III" race in the "old class" might be seen as an effort to keep the converted and modified S-yachts from competing in the same class as the 2nd-rule tailordesigned yachts. The "S-yachts" proved to be faster than the R-yachts especially in light winds, as is seen from the race results in 1926 when "Idyll III", although she is winning the combined "Old Class", in light wind has a better finnishing time than the winner of the 8mR (new) Class, Johan Ankers new design 8mR "Rollo". All above happened before the Americans in 1927/1928 decided to join the International R-rules classes 6mR, 8mR and 10mR. from 1926 the penalty on sail area factor "S" in formula for overlapping jibs was not included in the new measurement instructions. This introduced what today is known as the "Genoa". "In the same note I.Y.R.U. Permanent Committee issues warnings for changes that may come related to the larger fore sails? Neither of these two proposals was agreed to by the I.Y.R.U conference in October 1928. No restriction was put on limiting size on fore sail. The 75% restriction on max height of fore sail was decided by I.Y.R.U. in Dec. 1932, and max width of Genoa jib restricted to 0.5xR aft mast on 5,6 and 8 metres in Sept. 1937 as decided upon by the Permanent committee in Nov. 1936. Change in rule Formula came about in Oct. 1933. ", unquote. To the 2nd rule converted and modified 1st rule and S-yachts, could still have a competitive edge in light winds with new Genoas, but in general they were heavily punished when the wind picked up due to their light displacement. Most of them competing transfered to the N.L. classes. The N.L. handicap rule agreed upon by SSF in 1926 became also a limited success due to the Genoa entering the racing at the same time the rule was introduced. However, in Norway the N.L. rule with national revisions lived for many years. The rules restriction on limiting hight of mast was normally exempted from when calling for races. Her sail plan was in 1959/1960 changed complying with the R-rules requirement of mast height 2xR+1 above deck as she was fitted out with mast and sails from 8mR (old) "Lucie IV". She now commences racing in the N.L. Class and then the Scandicap handicap classes until 8mR WC at Hankö in 1983. 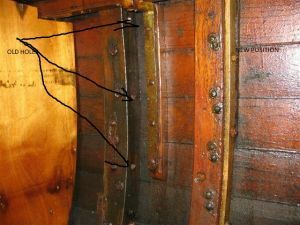 As part of the repair her bow beam was strenghtened with increased dimension almost to the front end. 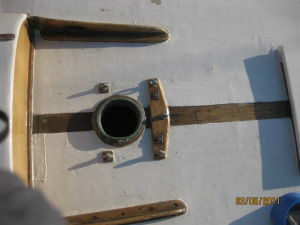 A new front stay bolt was installed going through the deck and the strenghtened bow beam some 60 cm aft the old bolt in deck comparative to her new sailplan with shorter boom from 8mR(old) H19 "Lucie IV". 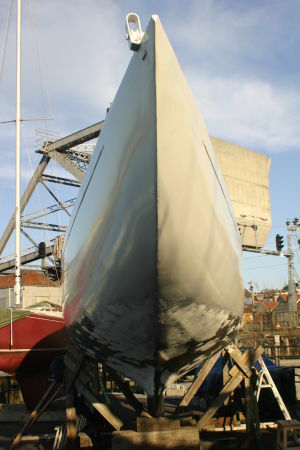 In the 1970-ties her mast foundation was further strengthened with steel frames and steel mast support, and her keel bolts increased in dimension. 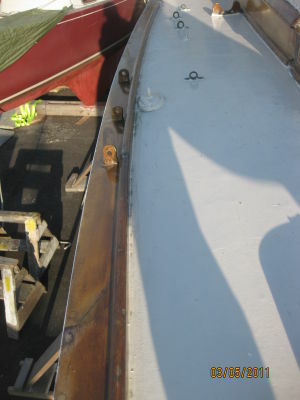 Bow section showing the increased bow beam installed 1959.
with increased keel bolts, installed in the 1970-ties. 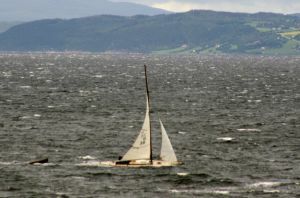 Thus making her hull stronger and longer lasting in the sometimes heavy waves crossing Strindfjorden in Trondheim. The rods between deck and mast foundation are installed as part of tuning up from 2000 and onwards. Every time a rule change was made, or a restriction imposed, it was either to make new faster boats or to restrict competition from new designs."